I'm a big fan of weighing cooking ingredients, particularly for baking. It's more precise, and when you get used to it, it's easier, too. And you don't have to wash as many measuring cups. I use mine a lot for weighing flour and sugar when baking, but it also comes in handy when I want to precisely divide a box of pasta in half. It's also handy when I need 3 or 4 ounces of chocolate and the bars I have don't divide naturally into those amounts. Or when I have bits and pieces of different chocolate bars, or I'm using chips. If you ever decide to do any canning, most recipes tell you how many pounds of different fruits or vegetables that you need. It's important to have the right amounts, or your food can go bad because the balance of food and acid and salt needs to be right. Three medium tomatoes is fine for a salad recipe, but not when you're planning on canning. Kitchen scales are much more popular in Europe than in the US, but I know a lot of avid cooks who love their scales. Fortunately, they're not a huge investment if you want to try one out. Not like buying a food processor. When I got a chance to test the EatSmart Precision Elite Scale , I figured I might as well give it a shot. On first inspection, the scale seemed sturdy, which makes sense considering it will weigh up to 15 pounds. That's a lot of food. 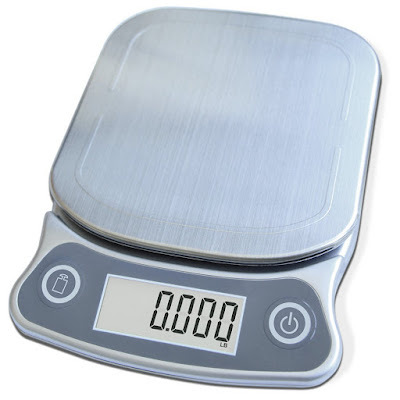 Probably more than I'd ever need, but there have been a few times when I've needed to weigh a bit more than 10 pounds. So it's possible I might some day want to check the weight of a roast. 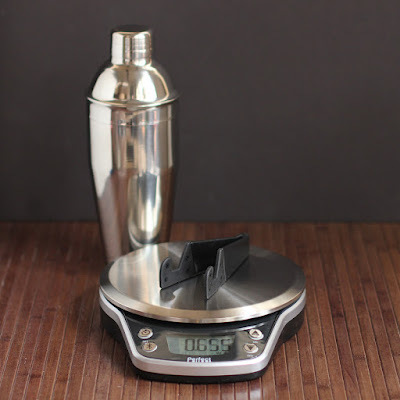 The scale weighs in three different modes: metric, ounces, and pounds. Yup. It treats ounces and pounds differently. While ounces and pounds are the same measurement system, there's a difference in how this scale reports the weights. If you choose ounces and put something on the scale that weighs 8 ounces, it says 8 ounces. Once the weight is over 1 pound, it continues to to weigh in pounds plus ounces. If you switch to pounds, it would tell you that your 8 ounces is .5 pounds, and when it goes over a pound, it continues to show the decimals. 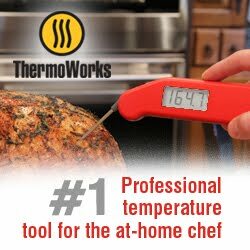 I do a fine job knowing that 8 ounces is 1/2 pound, but if I needed 1/3 pound - like if I was dividing a recipe, it's handy to have a scale that would read .333 pounds. On the other hand, if I needed 3 ounces, I want a scale that would tell me it's 3 ounces and not some decimal that would require me to do math. Most of the time, I need ounces or pounds and ounces, but I really like the fact that I can switch if I need to. I do have a few cookbooks (and I've seen recipes online) that use decimals rather than ounces. I guess the only other possible way it could show the weight is if it showed fractions, but that's something I very seldom see unless it's something like 1/4 pound, but that's easy enough to know it's .25 pounds or 4 ounces. I doubt I'd ever see a recipe that would ask for something like 4/7 of a pound. And if I did, I'd find a different recipe. I weighed a few things that I knew the weight of, and this scale is accurate. It reports pounds to 3 decimals (1.502 pounds, for example) and ounces to 2 decimals (3.45 ounces, for example) so it's more accurate than I normally need. But that's fine. The scale has a tare feature - which means you can put a bowl on the scale and get rid of the bowl weight. You can add an ingredient and then zero out that weight of that ingredient to add the next. Most scales do this, but it's worth mentioning. If you're looking for a scale, this one is a good choice. The price is reasonable and it has all the functions you need. I've only had it a short time, so I can't say how long it will last, but it seems solidly built. Who's it for: Cooks who want to weigh ingredients. Pros: Three different measuring modes. It's small, so it should be easy to store. Turns itself off automatically if you stop using it, so it saves battery life. Cons: I'm not sure if this is a con or a pro, but there are only 2 buttons for all the functions. If you seldom use it, you might forget that one button is the on-off and the tare function. Wishes: The shiny look is nice, but a lot of kitchen gadgets these days are opting for color. People who want their gadgets color coordinated might want a few choices.